Yep, I'm still layering chunky glitters over creme polishes, I just can't get enough of it. The base colour is new funky colour my sister-in-law gave me for my birthday. It's Avon Electric Green and it just went so perfectly with this glitter. The glitter polish is Nabi New Lime Glitter and it was so much easier to work with than the last gold and red one. I was able to apply two coats of glitter and still finish with a relatively smooth and flat nail. 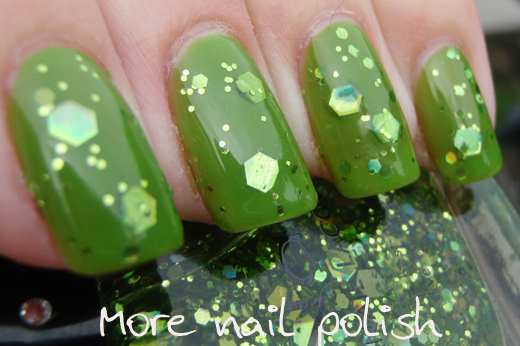 The glitter polish is made up of large green holographic hexes, medium green holographic hexes and small green hexes. These large holographic hexes are so freaking awesome. 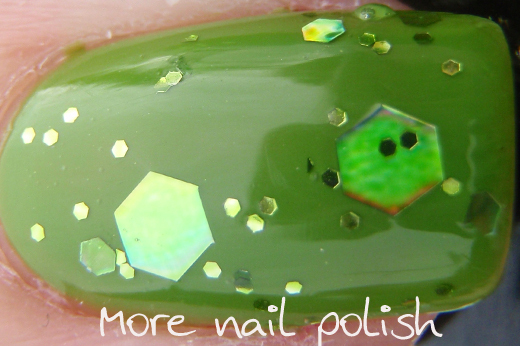 Green polish like this is pretty out-there, it's the sort of colour you have to rock with a bit of confidence. But anytime I wear 'strange' colours like this, I get so many comments from people. And I don't mean 'eeww, look at her weird green nails' kinda comments, I mean 'holy crap, look at her green nails'. Ok, those two sentences sound identical, but say them with the right tone and the second one is such a compliment. It's extraordinarily beautiful. 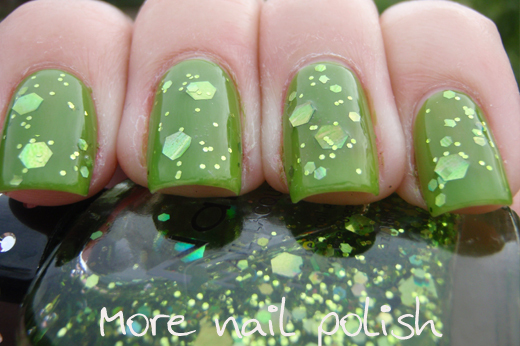 I really like green nails, and I love glitter, so this is perfect! ooouuuu pretty, love that colour and the glitter just tops it off perfectly!